Everyone knows beavers cut down trees to build their dams, lodges and to make submerged food piles on which the beavers can feed in the winter when ice covers their ponds. I found a spot recently where a gang of the tree-cutters had been very active and in unusual ways. In one area a determined beav had gnawed down a tree twice and it still hadn’t tipped over. 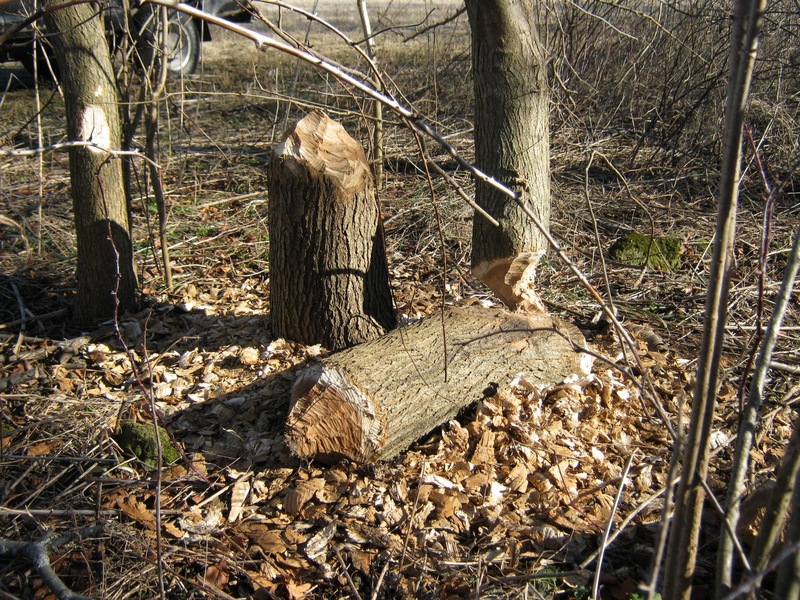 The tree that wouldn’t fall was a wide-limbed mulberry which had branches so intertwined with nearby trees that once the beaver bit completely through the trunk, all it did was slide off the stump and stand straight, held upright by the surrounding trees. 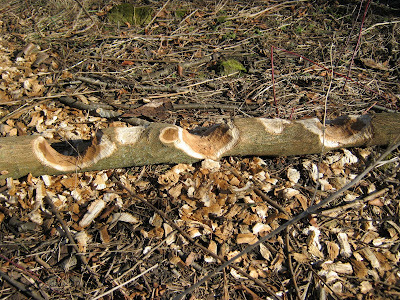 The enterprising (if not overly smart) beaver wanted that tree. So he cut it down a second time. The mulberry tilted a little, but still didn’t fall. I’m monitoring the situation. Maybe today there will be another little log made! Once he’s done, I’ll gather all the chunks for firewood. Nearby, a beaver had better luck. A different mulberry tree had been toppled, most of the upper branches had been hauled off, then the beaver, or I like to think the team of beavers, decided to have some fun. And if you are a beaver, what’s more fun than a tree gnawing contest? Check out the photo and imagine three beavers lined up, shoulder to shoulder, teeth bared. When the signal is given they dig in like Boy Scouts at a pie-eating contest. I can’t tell which one won the award, but I bet the chips were flying!